Is it still in the pipeline? 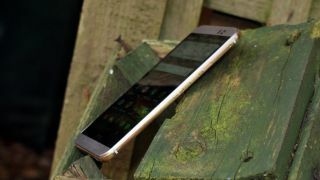 The HTC One M9 has landed, but we're still hearing that HTC might have a bigger (literally) surprise up its sleeve in the form of the HTC One M9 Plus. A handful of leaks have sprung up around it, but now we've clocked a full view of both the front and back courtesy of @OnLeaks, who has presented the mock-ups after allegedly playing with the handset. It's clear from the images that the phone looks a lot like the standard HTC One M9, but with several big differences. The main one is the presence of a physical home button beneath the screen, splitting the BoomSound speakers in half. Earlier rumours pointed to the phone packing a fingerprint scanner and while these images don't confirm that it would seem like the obvious reason for having a physical button. Another difference is the rear camera lens, which is circular, whereas on the normal HTC One M9 it's square. We'd seen this before on a leaked image of the phone, but what that didn't show which we're seeing here is a separate depth sensor, like the HTC One M8 had. The other difference is, of course, the size. Despite the name, the HTC One M9 Plus apparently only actually has a 5.2-inch screen, but that still makes it a little bigger than HTC's latest flagship. Speaking of the size, @OnLeaks also revealed apparent dimensions for the device, with it supposedly coming out at 150.9 x 72.5 x 10.15mm. The normal HTC One M9 is 144.6 x 69.7 x 9.6mm, so that would make the Plus version larger in every dimension. However, @OnLeaks acknowledges that the HTC One M9 Plus may have been cancelled. At this point it seems that it exists, but there's still a chance we may never see it. Then again, other recent rumours suggest it's coming to Europe soon, so there's hope yet. You don't have to wait for the M9 Plus to get a fingerprint scanner - the Samsung Galaxy S6 already has one.